The museum is open daily from 10:00-18:00 with the last admission at 17:00. Arriving in the morning helps beat the crowds inside and increases your chance of posing with the wax figures alone! We are comparing Madame Tussauds with Priority Access, Vienna Prices from leading ticket suppliers and Try to find you Cheap tickets prices on the market. Madame Tussauds Vienna is the 11th location for the Tussauds franchise which originally started in London, England. The waxwork museum spreads out across three floors and over 21,500 square feet of exhibition space. There are over 80 wax figures inside, each of which took more than 800 hours of work to create. It takes roughly 3-6 months to make each figure as 500 body measurements, and roughly 200 photos, are needed to create it. 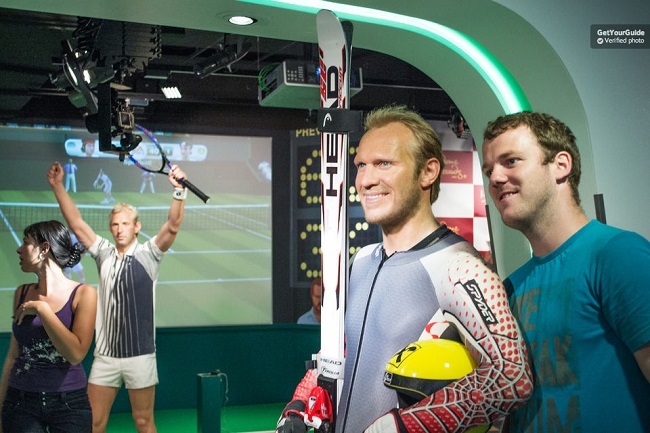 Your Experience With Madame Tussauds with Priority Access, Vienna? Get up close and personal with famous figures in their waxwork forms. Pose for photos with waxwork celebrities, actors, musicians and famous Austrian icons including Michael Jackson, Albert Einstein, Mozart, David Alaba, Gustav Klimt and Daniel Craig as James Bond. Visit the ‘Sisi Experience' inside the museum to learn more about Empress Elisabeth of Austria. Take part in the Interactive displays that provide entertainment for the whole family! Check out the new 5D exhibition area. What Madame Tussauds with Priority Access, Vienna Includes? Pick up an audio guide for your smartphone at the check in desk, it'll explain the process of making each wax figure. The audio guide isn't included in the ticket and is an additional cost. Travelers Reviews about Madame Tussauds with Priority Access, Vienna? Madame Tussauds Vienna is rated 4 stars on Tripadvisor. Customers noted the wax figures looked "amazing", that the queue jump facilites were "worth it" and the museum provided a "great experience" for young and old alike! Printed or mobile vouchers are both accepted (unless you booked through Viator then only printed tickets are accepted). Make sure bring your smartphone or camera to take a snap of the waxwork figures and trick your friends back home! Madame Tussauds Vienna, Riesenradplatz, 1022, Vienna, Austria.